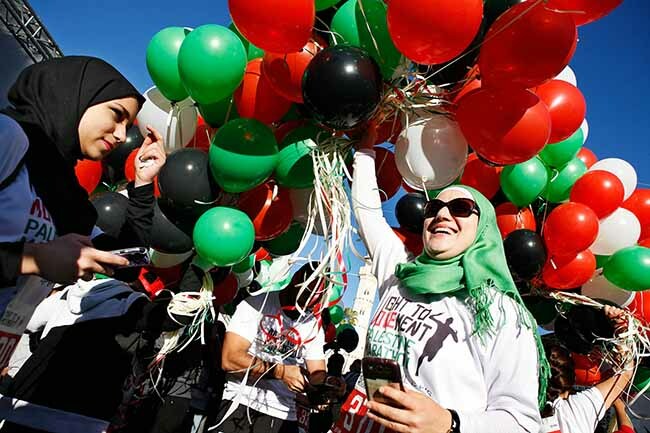 BETHLEHEM, Occupied West Bank – Some 4,400 athletes from all over the world too part in the fourth Bethlehem ‘Right to Movement’ marathon on Thursday, where runners took over the streets of the West Bank city and tackled distances ranging from 10 kilometres, to half and full marathons. The annual “Right to Movement” event owes its name to Article 13 of the Universal Declaration of Human Rights, which enshrines everyone’s “right to freedom of movement and residence within the borders of each state”, as well as the right to leave and return to one’s own country. 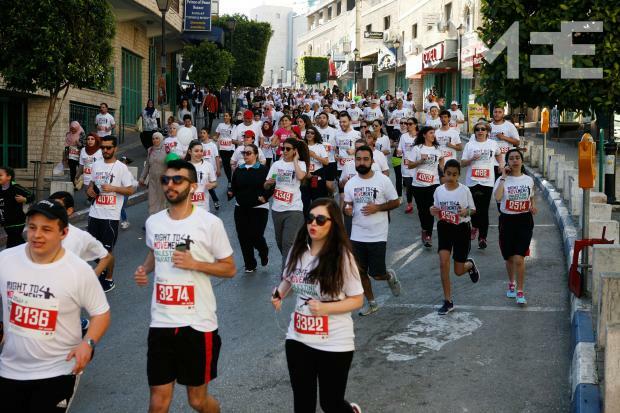 In its inception, the event organisers were unable to find a stretch of road running uninterrupted for 42km – since the infrastructure of the occupation, such as the Separation Wall, checkpoints and settlements have blocked the way. This forced them to come up with an unorthodox solution: design a 21km loop that full marathon participants must run twice. 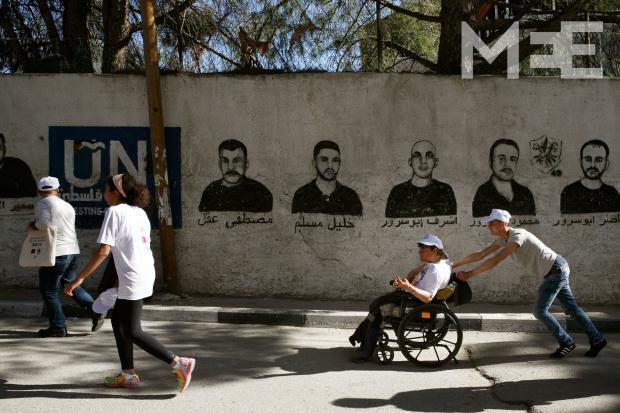 Sitting on a plastic chair by the side of the road in Aida Camp, Bethlehem, Abu Ra’ed surveyed the thousands of runners reaching one of the many points where the route suddenly makes a sharp u-turn and heads back. 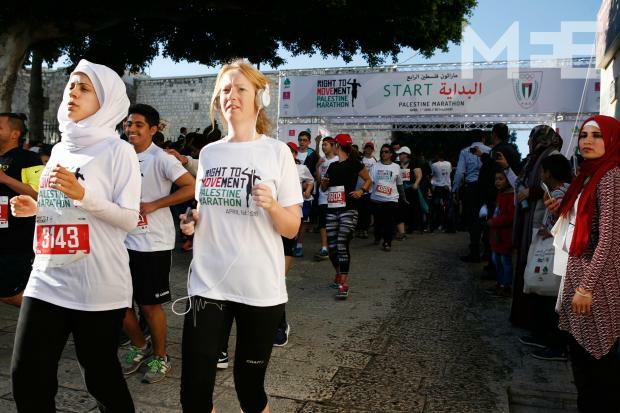 “It is great to see so many foreigners coming to run together in Bethlehem,” he told MEE. Ra’ed was displaced as a child refugee in 1948 from his home in Ras Abu Ammar. “They are running for our right to movement, yes, and that’s a good thing,” he said, content that so many people would travel to his country to make this point, but aware that little would change any time soon. Among the runners were also 50 disabled participants. Ra’ed Ahwethi travelled from Nablus to complete the 10km in his wheelchair. For many, he was a sight to behold as he sped through the Bethlehem streets. “This is the fourth marathon I’ve joined. I’m disabled and I use a wheelchair but I take part in many championships in Palestine and abroad,” he told MEE. 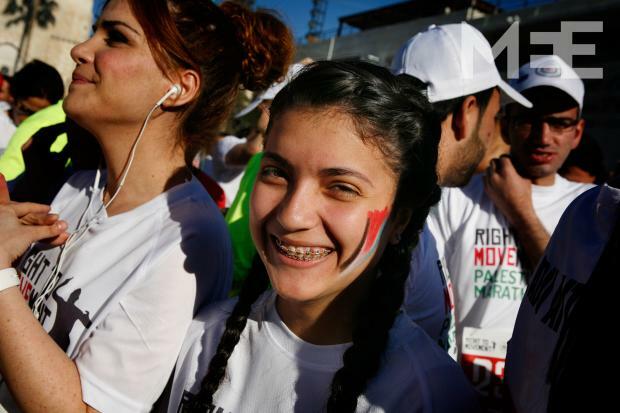 Eleven-year-old Noura travelled from Sur Baher, Jerusalem, with her father. “It is something special,” Noura’s father Mohammed told MEE. “We are here with thousands of people and it’s exciting, not like running by yourself,” he smiled as he began to follow a trainer on the stage for the pre-run warm-up. As loud music pumped through the speakers and the countdown began to the start of the race, 14-year-old Lamar grinned for the camera. “I am here to encourage people to run, look, I am a girl and I am here, it’s great,” she said as she approached the start line. Others added a creative touch. Mahmud Abu Shamsia, an actor with the Al Basta theatre company, walked the 10km route pushing a portable checkpoint equipped with phone, razor wire and interrogation cubicle. “We do street theatre and since the subject of this marathon is ‘right of movement’, I came with this checkpoint,” he told MEE. “We can’t move and this checkpoint is a symbol of that”.